Quentin Tarantino’s The Hateful Eight is our most anticipated movie of 2015 that doesn’t have the words “star” or “wars” in the title, so pardon us if we can’t help but get excited over the complete batch of posters that have arrived online. The film’s eight characters are spread across seven posters, showing off one seriously impressive ensemble. One film would be lucky to get two or three of these people. But all together? Speaking Quentin Tarantino dialogue? Can we buy a ticket now? The posters began trickling out last week, but you can finally check them all in one place below. There’s Samuel L. Jackson as Major Marquis Warren, a bounty hunter. There’s Kurt Russell as John “The Hangman” Ruth and Jennifer Jason Leigh as his charge, Daisy Domergue. There’s Walton Goggins as Chris Mannix, a man who claims to be the new sheriff in town. There’s Demian Bichir as Bob, whose title on the poster is “The Mexican,” so you just know there’s something else going on there. Tim Roth and Michael Madsen makes their grand returns to the Tarantino world as the dapper Oswald Mobray and the tough cowboy Joe Gage. Finally, there’s Bruce Dern as General Smithers, a former Confederate general. The plot of the film finds this motley crew of strangers locked in a haberdashery as they attempt to outlast a blizzard. Naturally, things go wrong, guns get drawn, and lengthy conversations explode into sudden acts of violence. Doesn’t that sound wonderful? 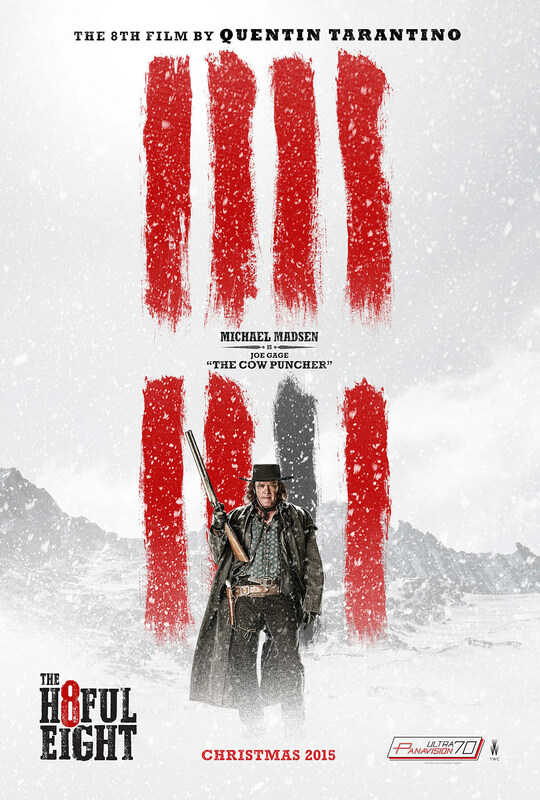 The Hateful Eight opens in limited release this December before going wide in January.